Keiji Yamagishi isn't a household name but if you were playing video games say, 25 years ago, you know the sound of his erratic musical madness. He's the composer behind the music in classic games like Ninja Gaiden, Tecmo Bowl, and Captain Tsubasa. Now he's finally released a record of his own. Retro-Active Pt.1 is the first part of a year-long collaboration with record label owner, Mohammed Taher. The record so far is totally fantastic and sounds exactly as you'd expect it to: The songs are much more sophisticated and expansive elaborations on the old 8-bit style he helped pioneer. Give it a listen. The soundtrack of Techmo Bowl is so awesome. This collaboration came about as an almost obsessive passion on the art of Taher. Indeed, in a way, it's pretty crazy that, Yamagishi is only just now getting around to making a solo record, since the the soundtracks he composed ages ago served as the inspiration for chiptune music, an entire electronic genre dedicated to the sound. Taher has devoted much of hist time over the last few years developing Brave Wave, a record label dedicated to paying homage to the old 8-bit artists, and bring out new music by them. And Taher is crazy about this stuff. He talks about the composers behind old video game soundtracks the way some people talk about 1950's jazz composers, dropping names I've never heard and will never hear again as if they should be common knowledge. Though the label is based in Japan, Taher lives with his family in Kuwait, where he works 60 hours a I week. Pile the label on top, "I'm effectively working 24/7, as all my free time is dedicated to working on our various albums and client projects," he told me. Taher spent three years looking for Yamagishi before he found him via Facebook in 2012. Taher conducted a month long email interview with Yamagishi around the time he was starting up his music enterprise. Mohammed: Since Capcom's Onimusha Tactics (GBA; 2003) have you been approached by other developers to compose game music? Or were you deliberately trying to stay away from the gaming scene? Keiji: After the PlayStation 2, in Japan, the direction for game music has changed, and if you're not a person into making movie soundtrack-like music, then a job won't come your way. Unfortunately, that's not my style. I can't conduct an orchestra. I feel as if my music is no longer needed. After people stopped hiring him to make music for games, Yamagish spent years writing original music for ringtones. Yup, ringtones. "This made me incredibly sad," Taher says. "This guy made some of the best music I've ever heard in my life, and now he's not doing it anymore." So Taher asked if Yamagishi would be interested in making new tunes. Taher would take care of the funding, production, publishing, and everything else if Yamagishi would just make the record. After thinking about it for a while Yamagishi agreed. The results are striking, and though it's all Yamagishi's music, Taher describes how exactly a cross-cultural, cross-continental artistic collaboration works. Somethings that were added after Yamagishi's original compositions were real live guitars to replace the synthesized ones. 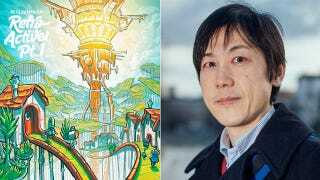 Taher also brought in Manami Matsumae, the composer of the music in Mega Man, to contribute on "Kaleidoscope." For his part, Yamagishi never really thought anybody cared until Taher came around asking for him. "It's quite an honor for there to be people who love and remember the music that I made long ago," he told me via an email through Taher. "I now know that there are people who appreciate the work I did from those days." Curiously, writing music for his own project proved, challenging after some 30 years of writing for others. "It was actually harder to make music without a game as a frame of reference," he says. "Until now, I just made music based on what was requested." Taher says we can expect Retro-Active Pt. 2 in the third quarter of this year. In the interim, Yamagishi is finishing composing music for a forthcoming game I had not heard of called Exile's End. It seems that after all this years his work has finally cycled back into style.